Water supply pipe extrusion line. This line is specialied in making all kinds of plastic pipes such as PE pipe, LDPE pipe, HDPE pipe, PP pipe, PPR pipe etc. Pipe diameter can be customized from 20-630 mm. All the electric brand are all international famous brand, you can change it easily. PE gas pipe: 32mm, 40mm, 50mm, 63mm, 75mm, 90mm, 110mm. 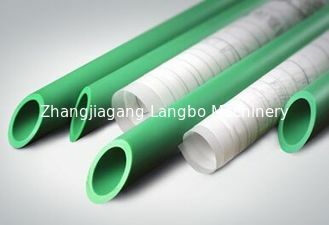 PE water pipe: 20mm, 25mm, 32mm, 40mm, 50mm, 63mm, 75mm, 90mm, 110mm. PE pipe thickness can be customized. We can offer the formula to save the production cost. e, transfer or discharge of chemical media, such as industrial piping system. 3. the plastic pipe production line mainly includes twin screw extruder, pipe extrusion die, vacuum calibrating water tank, spray cooling water tank, hauling unit, cutting unit and stack unit.the extruder is specially designed for producing variours pipe.